Click the button below to add the Effect Pedal Case ID 24x12x6 - 3/8" Ply - FACTORY CLOSEOUT! to your wish list. The inside dimensions of this case wall to wall are 24" x 12" x 6" high. 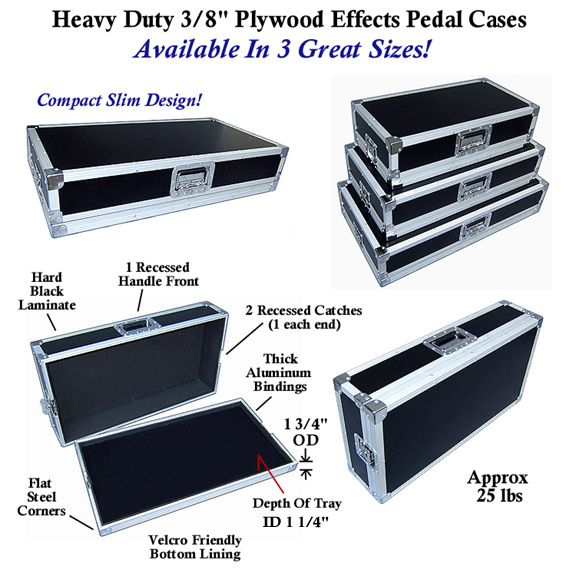 This heavy duty effects case is brand new! The pedal case ID 24x12x6 with 3/8” ply case is assembled with top quality plywood with a plastic black laminate on the outside. On the inside it is carpet lined and Velcro friendly. There are also heavy gauge aluminum extrusions machine riveted throughout and the corners are protected by heavy gauge steel flat corners. All catches and handles are spring loaded and are recessed into the case for added strength and shear resistance. The lid comes off and may be used as a pedal board. The base (lid) of the case is 1 1/4" deep. Impressive quality: from the product quality to the packaging, delivery tracking and quick turn around. And best of all: made right here in the US. I have purchased 5 cases from These folks and I've never been disappointed! Great product, spot-on pricing!!!! Looked all over for a product like this, and was delighted to find exactly what I was looking for on line. Sturdy for road work. Perfect size for a 6-7 pedal board. Just drop and play. Perfect! I purchased this case for a Fractal FX8 and it is perfect ! This is actually my second case. I bought a bigger one and it has lasted the test of time. I wanted to make a smaller pedalboard so I went ahead and bought A second one, same exact case, just smaller. These are solid cases. I make a pedal train style board and insert it right in the case. I use this as a 'live in' style case and works perfect. It's deep enough for my application and my first case has held up with wear and tear every weekend for about a year and a half. Still looks brand new. I would suggest these cases to anyone! Perfect road case that is perfect for my application. i bought this to use as a case for a novation bass station ii, thinking a pedal board case would be better than a keyboard case because i could use the bottom to make it wider. its perfect, now my synth sits at the perfect height and im not worried about it toppling off the stand. Fantastic Bargain! Fast shipping too! These are really high quality, all the hardware and materials are top notch. I've actually bought two of these and if I ever need another road case I'll come here first. This effects pedal case is nicely built with great hardware fittings. It will last for years and when it gets old, the parts will be replaceable. So it will last a long long time. Thank you!!! Excellent value! Very pleased with purchase. The item (Pedalboard case) came less than a week from placing the order, was well packaged and as described. This is an excellent value for the price. The latches are of high quality and lock tight. The inside dense foam padding on the lid and sides is a nice touch and should protect my effects unit (TC Electronics G-System) really well. There was also a roll of Velcro provided to anchor pedals or an effect unit. Nice touch. All-in-all, this is a well made product, priced right, that should last a long time. Just got this case and it seems to be well made. I looked it over carefully and didn't see anything wrong with it. I'm very impressed with the build quality. It has a minimalist design with 2 lockable butterfly latches, one on each of the short sides, and a spring-loaded handle on one of the long sides. I like that the corners are flat instead of round like the ones on my other ATA cases. This case is very light for 3/8" plywood, and the latches and handle work great. There aren't any feet on the case so I'm putting feet on the side opposite the handle, and maybe on the underside of the case bottom that will hold the pedals. I'm also going to add a piece of egg crate foam inside the case lid to help hold the pedalboard when the case is closed. I'm building a new pedalboard to fit the case so I don't know how it will hold up with the pedals and board in it yet. However, I'm confident the latches should hold the weight of the board and pedals without a problem. I got this case on sale with free shipping, which was a fantastic deal. But the standard price with free shipping is still a good deal. I'll definitely consider this company when I need more cab and head cases. Awesome build quality, great size for my limited board. I have 5 effects and a cry baby and I could fit 3 more effects easily. Also, can not find this quality for the price at any other source! Great job guys! Great case, great price= buy it. You will not be disappointed! I purchased it to hold my Peddaltrain2 which has a dimension of 24 x 12. of course this case is also 24x12. I thought it would fit perfect but its so tight I can't fit it in. I'm going to try and remove the inner padding to gain a quarter inch with the hopes it will just squeeze in. Great pedalboard value for light gigs! While this case isn't intended to survive being run over by a Humvee, it will do very well bouncing around in the belly of a minivan. For those of us who want more protection than a gig bag but don't need military spec, this self-contained pedal-board/case combo is a fantastic value -- $79 and they even give you a huge roll of Velcro to secure your pedals! And, the size is perfect -- like Goldilocks, not too big, not too small -- "just right." I'm very happy with the quality, price, functionality, and value. Great job guys! I ordered two of these and both of them are exactly the same and are built very solid and sturdy. I have no problems referring customers here or using them myself. Well-made with quality materials. Get it! This case is the new home for my Fractal MFC 101 board plus 2 expression pedals. The dimensions are perfect. In particular, height is a problem with many standard pedal board cases since the MFC is so tall, which was one of the main reasons I went with this case. The case is great quality and well put together, especially when considering the price. It came with a huge roll of velcro as well as a bonus. The only thing i might to is add some rubber feet, but not a big deal. The service and shipping were also very good. I was going to build my own case and stumbled across this one. I would spend twice this on materials alone to build case to the quality of this one. Great product and great deal! Just what I was looking for . Great case and received it quickly. Amazing price for sooo much case! Simply put I don't know how this company makes money! Ordered it online Sunday and was at my door Tuesday (free shipping no less). Recessed hardware and handles - tons of velcro supplied for the pedals and a road case built like a tank for just over $100.00!! Thanks Road Cases USA!!! I will get all my cases here from now on as a working musician in need to protect my investments and tools of the trade. Well constructed case. Very durable. I'm sure it will last me many years of use. Finally, a company that takes pride in their work. I have to admit, I didn’t have high hopes for this road case. I got a recommendation from the Axe-Fx forum for the MFC-101 floorboard. The price was very competitive so I went for it. I gotta say, I could not be happier. The build quality and attention to detail is amazing. I’m actually shocked at inexpensive this was. I wonder if they are even making a profit, or just selling them at a loss to get the name out there. Either way, I could not be more please. It perfectly fits an MFC-101 with a Mission engineering expansion pedal. Another quality job and product! I have been extremely satisfied with Road Case USA for years now. Very professional in customer service and product quality. I have and will continue to recommend them. This latest case is nicely crafted and was shipped almost as soon my order was placed. All of my gear has traveled the states with Road Case USA and never had an issue. Thank you. Thanks for buiding a pedal board case this sturdy. The absolute best ATA case for the price! I was building a custom pedal board and needed a case that could keep my board and pedals safe and secure. When I saw this case for sale, I was extremely hesitant about getting it. I didn't think it would keep my pedals safe and assumed it would be flimsy and poorly built. BOY WAS I WRONG. At my job, I work with many road cases that see tons of shows on a regular basis. I would venture to say that this case is just built just as well as ANY of them. I am so surprised at the amazing quality of this case! This thing is built like a tank and I will be sure to buy my ATA cases here from now on. For only $100, you CANNOT get a better built ATA case anywhere else! Top quality pedal board and fast service. My 2nd shopping experience with your company and great job both times. Also thanks to Rosa for help with an insurance quote. We ordered this pedal case to hold a video controller surface. The size was a perfect fit and the included velcro strips made mounting the unit to the carpeted interior a breeze. This case will get light duty but I feel confident that the equipment will be well protected. It was a great value for the price. If you need a Quality Case-this is the place! Product exceeds expectations! high quality and solid construction! Plus, a free roll of velcro tape to use for your pedals. It's not a small roll! I will be buying another one soon for my steel guitar board. Thanks! Road Cases USA is the best! I've bought several cases from you guys including the effects case and i'm extremely pleased with the free shipping, the great quality of your product and the fast turnaround from when i placed the order to when i recieved it. Great job, guys. Keep it up. I didn't put pedals in it... I loaded it up with a trigger interface, drum machine and Koass pad (to use with a drumset). It proved a bit flimsy. After figuring out a more compact arrangement of the same gear, I got this 24'' model in the 3/8'' . MUCH BETTER. feels very solid and safe for my gear. I'm excited to buy another for a different set of gear to expand this idea.